From early on in my youth, I had become a fan of Datasoft. Of course, this is no wonder, since some of my earliest gaming experiences were Datasoft games - Bruce Lee on C64 and Spectrum, The Goonies on Atari 8-bit, Pole Position on all three mentioned machines, Zaxxon and O'Riley's Mine on the C64, and Zorro on C64 and Amstrad CPC. However, it was Zorro that first got me properly interested in comparing different versions of games, because the two versions felt so different at the time. The interest was only magnified by the fact that I found out about this game around the same time a Zorro TV-show was airing on the Finnish television in the early 1990's. So, this is sort of like coming a full circle - now I only need to find the TV-series and binge-watch it again. Zorro is considered almost as much of a classic as Bruce Lee is - if not on all available computers, then at least on the majority of them, but the fan basis is definitely smaller than Bruce Lee's. At the time of starting to write this article, the Atari 8-bit version has a score of 6.2 at Atarimania from 1166 votes; the Commodore 64 version has been given a 7.8 by 108 Lemon64 voters; the score at World of Spectrum is 7.94 from 73 voters; the two regular Amstrad CPC scores are 13/20 at CPC-Power and 6/10 at CPC Game Reviews; and as usual, the Apple ][ version has no reviews or ratings anywhere, which makes doing this blog all the more useful and fun. The game's plot is simple and predictable enough: a noble Senorita is kidnapped by the evil generic villain, this time portrayed by your arch enemy, Sergeant Garcia, and has taken her to be kept inside some sort of a high tower. Seeing as you're the hero of all suppressed Mexican farmers, the Senorita chooses you to rescue her by dropping you a handkerchief, which you will need to deliver to her before she sets you on another, less imaginative task. While Zorro certainly shares a good deal with its Datasoft action-adventuring brethren, it cannot be called a mere copy of their other hit games. Bruce Lee was a logical and a rather straight-forward action-platformer with a little of puzzle elements, Conan was more of a puzzle-platformer, and the Goonies was a clear plot-driven multi-loading single-screen platform-puzzler with constant use of two alternatingly controllable player characters. In Zorro, the form is the most similar to Bruce Lee, and there's quite as much of action in Zorro as there is in Bruce Lee, but the emphasis is more on puzzles, and you need to do a lot of walking back and forth through the whole play area, which was a first for any Datasoft game. You would need to pick up and deliver objects to different places and use them in ways that would often have funny and useful results. On paper, it probably seemed like an idiot-proof concept, or at the very least, a good continuation of a well-established form of flip-screen puzzle-platformers with some action elements to justify the use of a well-known action hero protagonist. However, Zorro, along with Datasoft's other similar games, have been criticized for their lack of colour, unimaginative use of sound chips, and most particularly, the catacomb segment, which will be further explained later, when necessary. I always liked Zorro for its gameplay and its humour; the relative lack of colours never truly bothered me, nor did the catacombs, once I learned how to navigate them with ease. The music is another matter entirely, but at least that's something you can deal with, without affecting the gameplay. 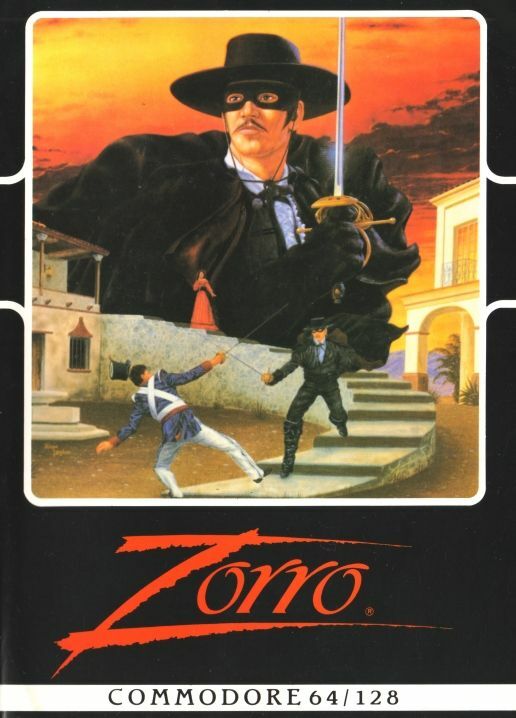 Similarly to Bruce Lee, Conan, the Goonies and other Datasoft classics, Zorro is well worth a try, but for absolute beginners, it's not the friendliest or the most attractive game to start your retrogaming hobby with. Looking back at my Bruce Lee comparison from just about 4 years ago, not only was the loading times' comparison a bit too much to handle at the time (and still would), but the whole form of comparisons was still very much work-in-progress, and looking at the first few comparisons now makes me almost want to do those first ones again. "Almost" being the operative word here. Now, Zorro's tape loaders are nothing particularly interesting to look at, particularly as the ATARI and C64 tape loaders have absolutely nothing to look at, and the SPECTRUM and AMSTRAD loaders only have renditions of the game logo surrounded by plenty of blackness, some texts at the bottom and both the U.S. Gold and Datasoft logos. Due to reasons yet to be revealed, I shall not show the two loading screens until later on in the Graphics section. Interestingly, though, the C64 loaders are quite quick to load, considering they all use a loader that looks like a basic ROM loader, only slightly altering versions of it. More interestingly, the AMSTRAD loader isn't too bad, either - it beats the SPECTRUM version's Americana re-release by 18 seconds. The first Erbe re-release for the SPECTRUM wins the race, though, and the alternative Erbe release has no real loading screen. The ATARI loader is just the same-old eternal blank screechiness. If you have played Datasoft's Bruce Lee, Conan or the Goonies before, the basic gameplay mechanics will come as nothing really new. You control Zorro with your joystick or predefined keyboard controls in a manner most obvious to any side-viewed platformers: left and right will make the man walk left and right, up will make him jump straight up or climb ladders if available, and down will climb ladders down if available. Jumping left or right will naturally require diagonals. The fire button is used for picking up and dropping items, as well as swooshing your rapier around when in combat mode. You enter the combat mode automatically when an enemy is near enough. For the game's misfortune, the swordfighting is mostly a game of luck, but at least tapping the fire button and moving in the enemy's direction proves much more resultful than not doing so; however, escaping a fight is also possible. Apart from the SPECTRUM version, all the others use a joystick as the default controller - even the APPLE version goes for a joystick calibration, and doesn't give you the chance to choose keyboard. The keyboard controls in the SPECTRUM version cannot be redefined, either: it's 2 for up, W for down, O for left, P for right and Z for action. It's not quite the traditional setup, so you might be happy to choose one of the joystick options instead. To explain some of the game's further logic, we will need to dig into the game's plot. This will be particularly useful for those of you, who have always had problems getting through the dreaded catacombs. First off, you need to collect three flashing items - a chalice, a boot and a horse collar. Otherwise you will not be able to resurface, as the exit will be closed. To access these three items, you need to perform lots of difficult jumps and carry things back and forth, and thus solve a few very important puzzles, which I will not get into too much here, since this is not a walkthrough service. But once you have managed to open up the grave in front of the church, you still need to pick up the last blinking item - the boot. Many of these puzzle situations involve strange gravity-related actions, and you need to be careful with your jumping, since the game is often a bit iffy on the flooring underneath Zorro, particularly on the edges. To make things easier, though, Zorro can grab a ladder from mid-air, so getting through the catacombs can become rather easy, once you have learned to use Zorro's curious falling and jumping mechanics to your advantage. The key to passing the catacombs is just to follow the money bags, but if you want to pick them up for bonus score, you had better know the route by heart then. Once you get past that point, the rest of it comes naturally. In the SPECTRUM version, though, Zorro picks up the money bags automatically, so you really need to know your way, or use the alternative passage on the second time, if you know how to access it. Now, getting to the actual comparison, we're going to start with the oddest version, which is, quite oddly, the ATARI tape version, which compared to the disk version (and all the other versions), has a much more compact map, which even dismantles some of the original puzzle elements. For example, the weight balancing puzzle concerning the chalice is reduced to just getting across the lake inside a cavern just under your starting point, pick up the chalice, and then get out. This reduced the playing time for about 6-7 minutes, since the bar scene is also gone. Also, the screen between the fortress' final section (featuring the tower) and the churchyard is gone, and if you try to go there, the map will loop to the starting screen. If you jump left from the tower, however, you will come straight to the churchyard. Apart from that, all the principle versions - ATARI 8-BIT (disk), C64 and APPLE ][ - play very much the same, with all the same quirks about jumping and climbing and landing on platforms, etc. If there is anything at all to make comments on in any of these three, the most obvious is probably, that the ATARI disk version loads a couple of seconds between every screen, so it feels a bit slower overall than all the other main versions. Compared to Bruce Lee, Zorro feels sluggish and makes less arced and graceful jumps, and his general lack of grace in dealing with platform-jumping and catching ladders and hangwires and such can feel a bit awkward after a session of Bruce Lee, and even the Goonies. But bear in mind, Zorro was designed to do more things than the other Datasoft game protagonists, so it's not that much of a wonder that his movements are not fully optimized. Before moving on, it needs to be said, that there are a few different versions of Zorro floating around the internet for all these versions, and a fully working APPLE ][ version is particularly difficult to find. Most of the versions available for the APPLE show their bugginess at the very latest when you have picked up the hotel room key, and you notice it will drop from your grasp automatically after a couple of seconds... and every item from that point on does it as well. So, the version you will want to look out for is a crack labeled "Zorro_another_3.dsk", by the Blade. This is the only disk image I've found to work completely. What we really need to focus on here are the AMSTRAD and SPECTRUM versions, since they are the most different ones in all the ways that matter. First, the AMSTRAD version has a very unbalanced speed - Zorro and most of the enemy soldiers run around at a surprisingly high speed, apart from screens with plenty of other things the computer needs to worry about. 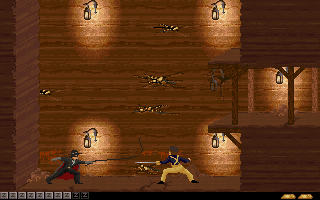 A good example of the unbalanced speed comes within the fortress, where you will find, that Zorro can outrun the bullets shot by the two window-shooters in the second screen. Zorro's jumping is very floaty and awkward on the AMSTRAD, making it often difficult to calculate, from what distance you should be jumping to another platform. Then again, the floaty and awkward jumping mechanics enable you to reach the boot without needing to use the trumpet, just by jumping across the gaps. Another problem is, that some of the platforms have not been completely tested for collision detection, making the chalice puzzle particularly devilish to solve. It doesn't help, that the game doesn't recognize carried weight as added weight to a balanced lift platform, and that the item you might be carrying doesn't necessarily land on the exact spot you're holding the item on. The Amstrad Zorro is also often very twitchy when climbing ladders or trying to grab hangwires or other such contraptions, so you need to be really careful to align yourself properly when entering and using any such thing. I also need to talk about jumping on springy surfaces, which feel useless at first, but they only require a few more repeated jumps than in the originals to get to where you want Zorro to reach at any given time. There's also a bouncy jump-related bug that I noticed: you can sometimes get Zorro to jump straight to the ceiling from the hotel's sofa downstairs, if you approach it from the correct angle, thus making the room door key practically useless if you can figure out how to exploit the bug at any given time. Concerning the roaming enemy soldiers, they appear from their routine doorways at a much slower rate than in the originals, and they can be pushed around more easily. This makes a certain part of the game slightly easier, but in general, swordfighting in the AMSTRAD version is more hazardous than in the originals. The final stretch features the catacombs, which are very differently mapped in the AMSTRAD version (you will see an extended ladder protruding at an irregular room), and lastly, the fair maiden you're supposed to be saving will push you out to the left the first time around, and you will drop into the moat with no chance of escaping your doom that time, so make sure you have at least two lives to spare when getting to your señorita the first time. Phew. That was a lot for one version, but I suppose you will now realize some of the reasons for the outcome for this section. The SPECTRUM version doesn't fare much better. At least the señorita-throwing-you-out-from-her-prison-tower bug has been fixed so that if you push the joystick (or keys) in a suitable diagonal position as you enter the tower, you will jump to the left instead of get dropped straight down, already making the SPECTRUM version much more player-friendly. It's not all good news, however - jumping onto moving platforms is next to impossible, and catching onto hangwires is not quite as automatic as in the originals. The cavern bit is more difficult to jump through, but in no way impossible - just needs different specific aligning and taking care on the bouncy pontoons. Similarly to the AMSTRAD version, springy surfaces require more jumps to get enough height, but there are no bugs of any specific kind here. A curious change to the basic game mechanics is, that you don't need to push the action button to pick up any of the flashing items. This change has unfortunately altered the catacombs section as well, in that now you also pick up all the money bags automatically as you pass them. This makes it necessary to either memorize the route or find the alternative underground passage. One of the most annoying alterations made for the SPECTRUM version is the speed of the moving skeletal ladders in the catacombs, which is superbly slow, which not only requires patience of a saint to get you anywhere, but also makes you time your movements along with the moving ladders so that nothing unwanted would occur. While none of this is quite as bad as the AMSTRAD version, it's still a bit too awkward to be considered even nearly the same quality of an experience as the three originals. Like so many other Datasoft games, Zorro's visual style is a bit on the blocky side, with scarce colours used for both atmosphere and getting all versions look as equal as possible, which should have been a boon for the APPLE ][ gamers back in the day. The rest of us tried to come to terms with the relative lack of colour - some failed, some managed to live with it. There are a couple of exceptions to the default look for Zorro, which is basically why this section is at all necessary this time. Atari 8-bit, Commodore 64, Apple ][, Amstrad CPC, ZX Spectrum. text thrown over the screen from where your game starts. So, the proper game logo and every other graphical thing outside of the game content is restricted to the loading screen. The AMSTRAD loading screen looks very similar to the SPECTRUM one, but the "orro" bit from the "Zorro" logo and all the text lines at the bottom are dark blue instead of cyan and green, respectively. Although the smaller number of colours used sounds a bit lazy, on the whole, the AMSTRAD loading screen looks just slightly better than the SPECTRUM one, mostly because the U.S. Gold / Datasoft logo structure is more carefully drawn. The three originals don't really feature a loading screen either, unless you count the copyright screens as such. However, only in the APPLE version and the ATARI disk version the copyright screen is shown during loading, and the tape versions have it shown the first thing after the loading has been completed. After the copyright screen, the proper title screen is shown, which has a more rustic/painted and carefully detailed feel to it than what's seen on the SPECTRUM and AMSTRAD loaders. There are no particularly obvious differences in the three title screens, other than the uniquely shown credit in the C64 title screen. The starting scene. Top row, left to right: Atari 8-bit, Commodore 64, Apple ][. Our story begins with Zorro trying to serenade the apparently beautiful but kind of blockily pixelated señorita standing on the traditional balcony, when the evil sergeant Garcia comes and snatches her up and carries her all across the town and puts her into a prison tower in his fortress. Despite having some continuity bugs, this is one of the greatest plot implementations in any 8-bit game ever, as you can see Garcia carrying her all the way, and at the end of the road, the draw bridge is drawn up. Very effective and frankly a bit unexpected for a game of this age and size. I decided to use only the first screen here, because practically all the other screens will be shown during the course of this comparison in any case. It might not come as much of a shock, that this whole animation bit from the second screen onwards is missing from the ATARI tape version. From the beginning, it's clear that the SPECTRUM and AMSTRAD versions are approximations of the other three versions. 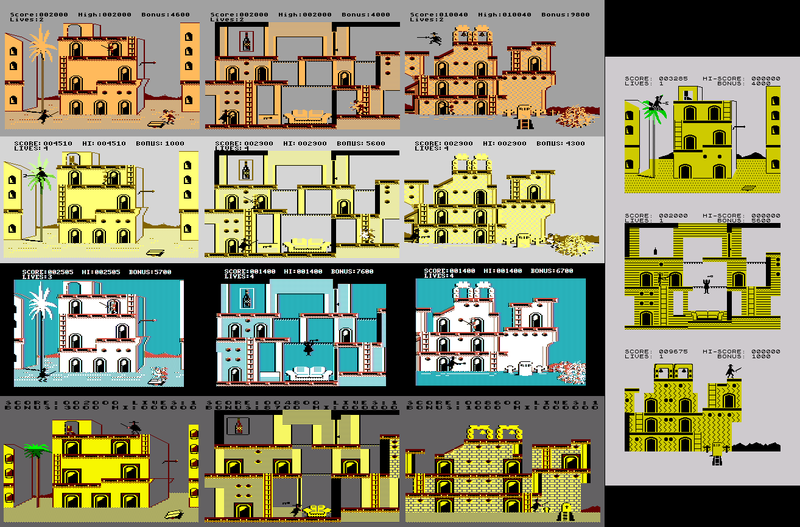 The details have not been copied with care (see the vine under the balcony and the balcony roof), the SPECTRUM version looks a bit squished (which is natural for its screen resolution) while the AMSTRAD version looks stretched sideways, and the animations in the AMSTRAD version are particularly sloppy and twitchy. The amount of colours is again an interesting thing to examine, since the game has so little in the first place: the ATARI and APPLE versions have 4 colours used at any given time; the C64 version usually has 4, but can have up to 6 colours at best; the SPECTRUM version has only 3 colours for the majority of time, with a splash of maybe one or two other colours when absolutely necessary; and the AMSTRAD version can boast of having usually 5 colours at any time, and I counted 7 colours on the screen at best. The thing is, though, the majority of the game is still the same yellowish-black-and-grey with some red/brown thrown into the mix, depending on which version you're playing, and the extra colours come only in some little details. Also notable is the screen size, which apart from the obvious pixel width making the screens look either more cramped or spacious than they might otherwise be, can also cut down a bit of the screen's width, as it does in the APPLE version, sometimes leaving some details out. Screens from the chalice puzzle. Top row, left to right: Atari 8-bit tape/disk, Commodore 64, Apple ][. As we get into some puzzle-solving for the first time, we notice certain differences in styles regarding different areas in the game. The C64 and AMSTRAD versions make good attempts at switching border colours to highlight the areas and their moods, while the SPECTRUM and APPLE versions stick to their chosen palette all throughout the game. In the ATARI version, the border colour only changes somewhat in the catacombs, as you will see further down this section. As simple as this trick is to produce, I'm surprised at the versions, where this doesn't occur. What we can also see here in these screens, concerns the general use of details in the SPECTRUM and AMSTRAD versions. The SPECTRUM version doesn't have as much of wallpaper patterns or super-detailed shapes in the caverns, and it might as well be said out loud now: Zorro is all black. Not dark-skinned, just that it doesn't appear as if he has any skin at all, since his black suit eats up all his other colours. Same thing in the APPLE version. The weird thing about the original Zorro's sprite, though, is that it changes complexion during jumps - if he's usually red- or brown-skinned, his skin turns pink when jumping. Only the AMSTRAD version has a completely normal-looking Zorro, with a consistently pink/caucasian-type skin colour. Speaking of the AMSTRAD version, it has some unique alterations to the map design in this particular area to comply with the awkward jumping and ladder-grabbing mechanics. The bouncy pontoons floating in the cavern's water surface are aligned differently (making jumping onto the ladder practically impossible) and there's also a platform you can land on below the ladder between the first two balancing lifts in the room with the chalice. Minor details, but perhaps worth noting - not necessarily graphically, but at least there is difference in functionality. Above: screenshots of the stable. Below: screenshots of the bar. Left to right: Atari 8-bit, Commodore 64, Apple ][, Amstrad CPC, ZX Spectrum. This I have always found a bit odd about the map logic in Zorro: the stable is above the bar. Or maybe it's meant to be on the backside of the bar, I don't know. The odd logic disappears completely, however, when you play the ATARI tape version, which doesn't feature the bar screen at all due to the missing chalice puzzle screens, and I can't say the game is any better or more logical for it. Other than that, you get the same things I've talked about before: lack of details in the SPECTRUM version, a relative overabundance of colours in the AMSTRAD version, etc. One thing I could add at this point to make this paragraph longer, is that in the SPECTRUM and AMSTRAD versions, the doors don't open and close when enemies walk through them, which in addition to being yet another graphical element missing, also makes the general playability slightly more awkward, since you are given no reaction time to enemies appearing. Perhaps I should have mentioned it in the Playability section, but better late than never. The three most visited screens: the boot puzzle screen, the hotel room and the churchyard. Top to bottom: Atari 8-bit, Commodore 64, Apple ][ and Amstrad CPC. ZX Spectrum screens at the right end. These three screens are, if I have counted correctly, the ones you spend most of your playtime in - particularly the hotel and churchyard screens, because you need to repeatedly pick up the key from downstairs to access the upstairs room, into which you need to circle around through the long set of church ladders and platforms. One can easily grow to hate this area, particularly when doing a comparison of all five versions. First, the screen with the palm tree and the blinking boot. The most eye-catching difference has to be the colour of the leaves on the palm tree. Whereas the ATARI and APPLE versions keep themselves strictly to the main set of colours, the other three versions go bolder with green colours. The C64 and AMSTRAD versions even use two different shades of green, while the SPECTRUM version sticks to a basic all-around green. Naturally, the one green in the SPECTRUM version gets messed up the second you climb up the tree and witness an impressively rare example of attribute clash in the game. The only other curious detail-related difference I can mention is the seesaw mechanism, which in the AMSTRAD version goes to both extremes, while in all the other versions, the two positions are straight and a 30-degree angle. Second, the hotel screen. The two biggest points of interest regarding each version's graphics are the item in the hotel room and the sofa area. As you can see, the AMSTRAD version's sofa is ridiculously narrow, and proportionally wrong, if you consider that it's supposed to be a sofa for two people to sit in, and Zorro alone takes the whole width. Only the oddity of the jumping mechanics in the AMSTRAD version can explain the narrowness of the sofa and the immediate area in general. Then, the item in the room has mostly the appearance of a huge framed painting - which is not the item's actual size once you pick it up and carry it. In the SPECTRUM version, the item you see in the room is the actual item you pick up, which is perhaps more logical, but reduces the amount of graphics by the number of items. The churchyard screen features two alternating areas: the bell holder structures, which will each hold a bell once you carry them into them, and the grave, which will open up once you have completed the previously mentioned mission. Apart from the bells being yellow/golden in the AMSTRAD version (but only once you have picked one up from the hotel room), and the gravestone having a cross instead of RIP, there's nothing particularly interesting about the two alternating areas in the screen. What's more interesting, is that the church hogs almost the entire screen in the AMSTRAD version, when there should be about 1/5 of the screen's right edge free of any structure... unless you count the hay stack as a structure, which the AMSTRAD and SPECTRUM versions don't have. Catacombs entrances and exits. Left to right: Atari 8-bit, Commodore 64, Apple ][, Amstrad CPC, ZX Spectrum. Yes, it's everybody's favourite bit, the catacombs. Now, remember what I said about changing border colours earlier? This is the only area, in which the ATARI version also changes the border colours for mood enhancement, but the info display section is still kept as black text against grey background, so you never get a fully dark screen on the ATARI. Nor do you get the full catacomb experience in the SPECTRUM version either. 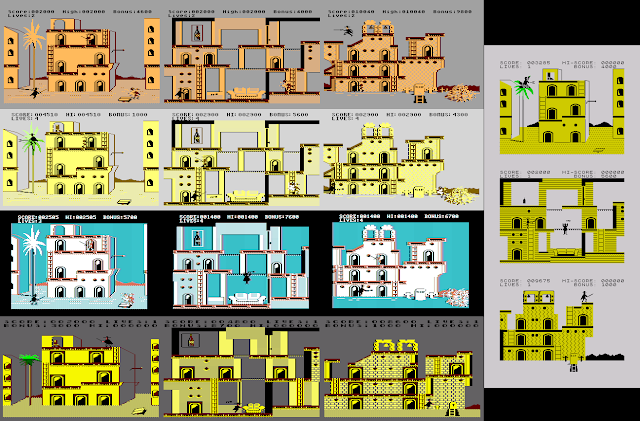 The APPLE version has black borders by default, and the C64 and AMSTRAD versions share the proper colour scheme for the catacombs, but the AMSTRAD version has an odd exit, which doesn't feature the blinking items at all, but rather an extension of a skeleton ladder, which looks more like a graphical bug, rather than the intended exit. The SPECTRUM version showcases its attribute clash a good amount here, but apart from that, the only other noteworthy thing there is the exit sign, in which the blinking items are in an alternate order. Fortress La Carcel's prisoners. Top row, left to right: Atari 8-bit, Commodore 64, Apple ][. La Carcel, the fortress of sergeant Garcia, is perhaps a minor letdown after such an ordeal of getting inside it. It is interesting to see the locked prisoners forming a human staircase after you free them for the first time in any version, and it's also fun to watch Zorro outrun the bullets in the AMSTRAD version, but the fireworks are still waiting for you two screens to the left. The ending screens (sorry for the spoiler). Top row, left to right: Atari 8-bit, Commodore 64, Apple ][. Even at the expense of spoiling you the ending, I had to do this to prove a point - the SPECTRUM version is undeniably the most graphically underachieving version. Perhaps it needed to be so due to memory restrictions, just to get all the map data included, but considering there have been many more flip-screen platforming adventures made since, albeit in much different ways, I'm fairly certain it could have looked better. As it is, particularly considering its age and the game's complexity, it's not as bad as it looks compared to the others. Still, the ending is a fine metaphor for the SPECTRUM version - it works, but don't expect too much. If there's something that gamers everywhere have a mutual dislike of about Datasoft's Zorro, it's the main theme tune. I'm not sure if I hate it, but it's both too short and too unepic as a composition to give you any sense of reason for being there. Sure, it uses all available channels in all versions, and it's not exactly badly made on any version. However, if you think of the locale to which Zorro is situated, the epicness (or at least the length) of the journey you're about to embark on, and the different situations you're going to face, you would hope for more than one tune to back you up, and bring a good dose of Spanishness to your ordeal. The only versions, in which the Spanish harmonics are represented properly are the C64 and ATARI versions, while the others tend to veer towards an improperly Germanic major harmonic, where harmonies exist. The main melody line is also featured in the APPLE ][ version, but due to the single-channel sound output, it doesn't have the necessary harmonics. The said Spanish harmonics are the only reason that I can think of for the tune to even exist in this game, and when it's gone, it's just a half-arsed attempt at creating another Robin Hood/Dennis Moore theme. For the 12 seconds that the tune lasts, it's a fine enough introduction to the game, but one would have at least wished for a differently instrumentated version of the same tune as an in-game version to make up for the relative lack of variation. There are two variations, though, one of which is only played in the catacombs, and it's a slower minor key version with a slightly darker overall tone; and the second of which is just a double-time version of the regular tune when you engage an enemy in a swordfighting meleé. For those of you who manage to complete the quest, you will be rewarded with another - different - tune (finally!) along with some heartwarming animation. You do have the choice of turning the music off by pressing the 'S' key, in which case you only hear some scarce sound effects, since Zorro's quiet walking is very quiet indeed. That doesn't mean there aren't plenty of sound effects to hear - there's just lots of quiet in between hearing them. In the C64 version, you get the bounce noise from jumping on a springy surface, clinking noises and the 'Z'-drawing swooshes when fighting, two different bells ringing when installed into their respective spots, a splash when you fall (or something else falls) into a watery grave, a suitable effect for a pub patron drinking the entire contents from the bottle you give him, gunshots in their corresponding screens, the drawbridge making drawbridge-type noises when it's being drawn, a funny melody played on a trumpet and the weight-balanced lift platforms squeaking. Did I miss anything? Most of the mentioned sound effects are present in the ATARI version, but not quite all, and what you get sounds overall not very representative of what the sound effects are supposed to represent, but give a good enough approximation. Again, you need to toggle out the music to hear the effects. The SPECTRUM version is unhappily restrained by the 48k beeper, which with its single channel is only made to use single melodic line, alternating between the primary and the secondary (lower) melodies. I guess whoever from James Software was responsible for coding the music, didn't think it was all that important, since it was only used in the title screen and the Game Over screen, despite of how the game would end. The sound effects are even more scarce than in the C64 and ATARI version - you only get the 'Z' sound from your sword, the church bells and a couple of other puzzle-related bleepy sound effects. Strangely enough, the APPLE ][ version sounds exactly like you would expect the SPECTRUM version to sound like with all of its majestic single-channeledness: as I said, the music is as much correct as it can be with the beeper, but also, there are plenty more of very Spectrumesque blippy sound effects. James Software also failed to get the music right for the AMSTRAD version, but at least they had the use of a proper sound chip to produce three simultaneous voices, making it already more impressive than the SPECTRUM soundtrack. However, there is no music in the ending, which is a slight letdown. At least you get much more sound effects, such as the bouncy noises from springy platforms, watery splashes and the squeaky lift noises. Not all of the original sounds are in, but a good portion of them, which is more than you can say from the SPECTRUM version. That brings us to a clear conclusion for this section. Despite of the outcome here, all five versions are playable enough - even the Amstrad version, although that one's the most annoying one of the lot due to the occasionally twitchy controls and worse than usual collision detection. Again, simply because of the better playability, I would rather recommend the Spectrum version over the Amstrad one, but the graphics and sounds in that one are a bit poor, to be brutally honest. For old Zorro fans, the Atari tape version is recommendable simply due to it being much shorter than the other versions, but if you're looking for a full-blown Zorro experience, the C64 version is the way to go. Some of you might wonder, why didn't I include the MS-DOS version into this comparison? The reason is simple enough - there was no DOS version of this particular Zorro, even though the very short Wikipedia entry on the game lists an MS-DOS version. Well, don't believe everything Wikipedia says, because at least in this case, the Zorro game made for DOS was from 1995, developed and published by Capstone Software. If you ever thought the Datasoft game was bad, you'll be glad to know the Capstone game is even worse, as it's just a badly programmed Prince of Persia clone, and after a few minutes of trying to get anywhere, you'll be wishing for your few minutes back. Just stick to the old Zorro, that's my only advice. That's the first one from my final stretch down, hope you're in for the rest as well! Thanks for reading, see you next time with something a bit different!